‘Excellence in Concrete’ was celebrated at the recent Concrete NZ Conference at Claudelands in Hamilton which hosted the Readymix Sector Group Awards and the NZRMCA Plant Audit Scheme Supreme Award. The New Brighton pier suffered damage in the 2010 and 2011 earthquakes. The spalling of concrete and straining of reinforcement at the plastic hinge zone in the pier columns was predicted to significantly shorted the structures lifespan. The specification required a (60MPa) high strength, marine-grade mix, that included a shrinkage compensator, reduced aggregate size, and was to be delivered as a self-compacting mix via the tremie method. 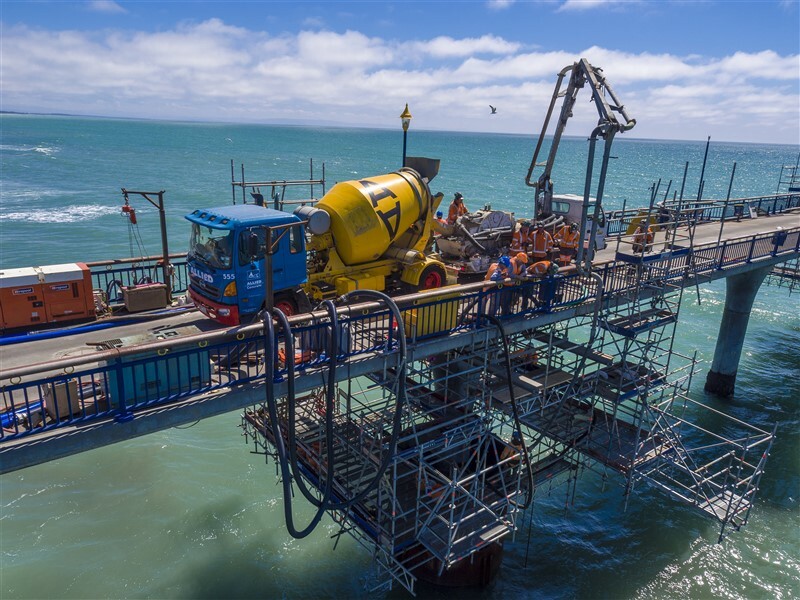 Due to weight-restrictions on the pier access ramp, loaded ready-mix trucks had to discharge via concrete pump into a mini-mixer, which then reversed along the pier to a second concrete pump located above the columns being repaired. Pours often took up to 1.5 hours to complete and were carried out in both summer and winter. Good communication and co-ordination was required between Allied Concrete, Fulton Hogan and Marty’s Pumping to ensure that this was performed safely and efficiently. Judges’ citation. This project ticks all the boxes. The sophisticated mix design to meet intricate engineering requirements, combined with the relay-pour method on a highly visible structure in a harsh marine environment, was challenging on many levels. Allied Concrete’s technical acumen, comprehensive preparation and monitoring, attention to detail must be acknowledged, along with their confidence to adopt innovative solutions to get the job done. Severe Tropical Cyclone Gita ravaged the South Pacific in early 2018. Gita hit New Zealand as a strong ex-tropical cyclone, with the top of the South Island being heaviest hit, with floods and strong winds leading to a state of emergency being declared on 20 February. With its operations halted by the flooding and a power outage, Higgins Concrete in Richmond chose not to ‘shut-up shop’, but rather mobilise its equipment and resources to assist the community. Thanks to a lift on the Higgins Concrete loader, children escaped their childcare centre which was being threatened by rising flood waters. While social media was used to offer sand bags to those that wanted to protect their homes. Parents, police and the wider Nelson community were extremely grateful that Higgins Concrete chose to ‘pay-it-forward’ by helping its customer base in a time of real need. Judges citation. Higgins Concrete’s unsolicited response on behalf of the local community during a natural disaster was extremely impressive. Taking pride in your customer’s satisfaction is part of day-to-day business, yet Higgins Concrete went the extra distance during Cyclone Gita, securing something bigger – community respect and gratitude. Students from Canterbury’s Rolleston College gained valuable, hands-on experience of working with concrete in a collaborative community project involving Christchurch Ready Mix Concrete and Absolute Driveways. Ninety Year 9 students were involved in the two-day exercise. The stimulus for the project was the students’ wish to base their “Connected” class learnings around planning and building a school garden. The project entailed research, design and construction stages, with the concrete delivery and placement part being well received by the students. 3D printers were used to make shapes cast into concrete, while local Halswell Quarry rock was placed in the concrete paths to form patterns. Everyone felt that the project was a worthwhile undertaking, and that it was great to have suppliers and contractors working together to help the students and at the same time promote the product. Judges’ citation - Responding to a request from the local secondary school, Christchurch Ready Mix Concrete was generous with its time and resource. The value gained from offering students a hands-on experience with concrete was considerably larger than the scale of the project. Christchurch Ready Mix Concrete deserved to be commended for going the extra distance on behalf of the community. The judges highlighted the fact that over an extended period this plant has consistently received Excellence Awards. It demonstrates the stead-fast attention to detail by the concrete production team. The plant is an example to all other ready mixed concrete producers across New Zealand. It must be noted that Allied Concrete’s Penrose Plant, which was awarded the Supreme Award in 2013, remains the plant with the longest record of consecutive Excellence Awards.